Living in the south east all my life and not really being a plant twitcher willing to travel hundreds of miles to see a particular species has meant that certain species that grow only at the other extremes (especially northerly) of Britain have achieved an almost mythical and inaccessible status for me. 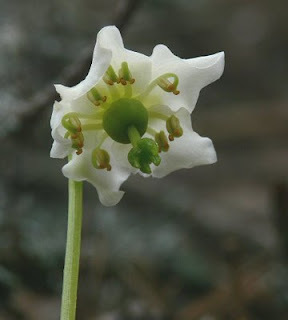 One of the most extreme of these has been Moneses uniflora, so gloriously commonly known as St Olaf's Candlesticks or more mundanely One-flowered Wintergreen. In Britain this species is confined to a dozen or so sites in the pine woods of northern Scotland, not an area I visit very often and never at the right time of year to see the plant in flower. It appears to be in decline due to loss of habitat and is another species covered by Plantlife's Back from the Brink programme. For many years when I have occasionally come across pictures of this plant I have drooled over the unlikely appearance of it's flower. This year we spent a spring holiday in Les Grande Causses region of southern France walking and plant-hunting and on the first day wandered into a pine wood that in places (amongst many other goodies) was carpeted with small "candlestick"-like buds shown in the picture above. At first sight I had no idea what they were but a few more metres and all became apparent because there in their full glory were hundreds of Moneses in full flower. 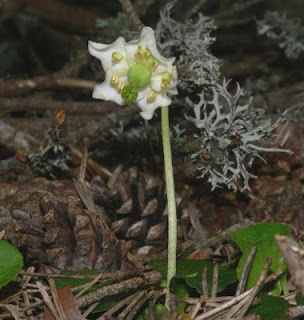 Two small green leaves hardly emerging from the pine needles and associated litter with a flower stem about 5cm high and a flower only about 2cm across. And what a flower, I find it absolutely spell-bindingly (!) beautiful living up fully to its mythical status. The holiday was already fulfilled just for that moment when I realised what we had found. Its a shame that such a moment couldn't have happened in Scotland but better in France than never. In writing this I realise that other members of the same family (Pyrolaceae) native to Britain have also avoided my gaze. Of the five native species (belonging to three genera, Moneses, Pyrola and Orthilia) I only remember seeing one in this country, Common Wintergreen, Pyrola minor. That was growing on a roadside in Buckinghamshire at a site more famous for Ghost Orchid (Epipogium aphyllum) but that is another story. Hi John, I have been lucky enough to see One-flowered, Serrated and Common Wintergreens all in Culbin Forest, Moray. 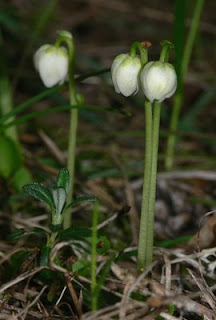 Also present were Twinflower and Creeping Ladie's Tresses, so a very good day was had. My Moneses were few and far between, in lonely, quiet, dark areas under the pines and as such did, as you say, exhibit a certain aura. Great memories.